In a gallon zip lock bag, combine chicken tenders with ½ cup Gochujang Sauce and marinate in the refrigerator for a minimum of 1 hour. Whisk together red wine vinegar, honey and salt in a medium bowl. Add shaved cucumber and carrot and toss to coat. Cover and set aside until assembly. Remove chicken from marinade and discard the extra sauce. Grill or pan sear until cooked through. Slice into bite size pieces. Remove and separate biscuits from packaging. If making 16 smaller buns, cut each in half, or if making 8 large buns leave them whole. On a surface slightly dusted with flour, gently using a rolling pin to roll out the buns while maintaining a circular shape. Once buns are about ¼” thick, gently fold in half and set aside. Heat a large steamer basket with water over medium-high heat. Once boiling, place buns 2” apart on the steamer rack, cover and steam for 12 minutes. Continue until all buns are steamed. With a sharp knife, gently open the steamed buns. 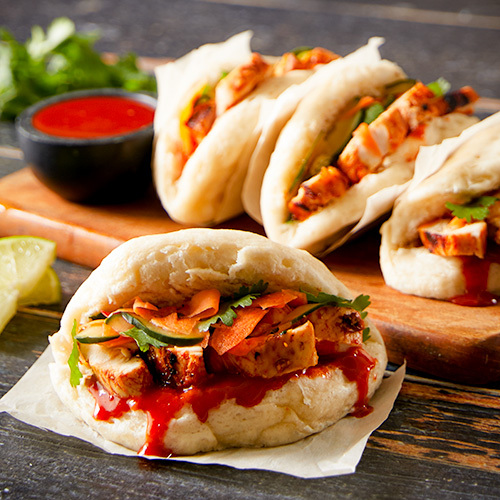 Fill each with 1-2 Tablespoons additional sauce, chicken, pickled vegetables and garnish with fresh cilantro.